The farmers market is now open outside in all its glory. I am beyond ready to embrace warm weather and all the food choices that come with that. Unfortunately, it was cold and rainy all weekend ultimately leading to comfort food craving. 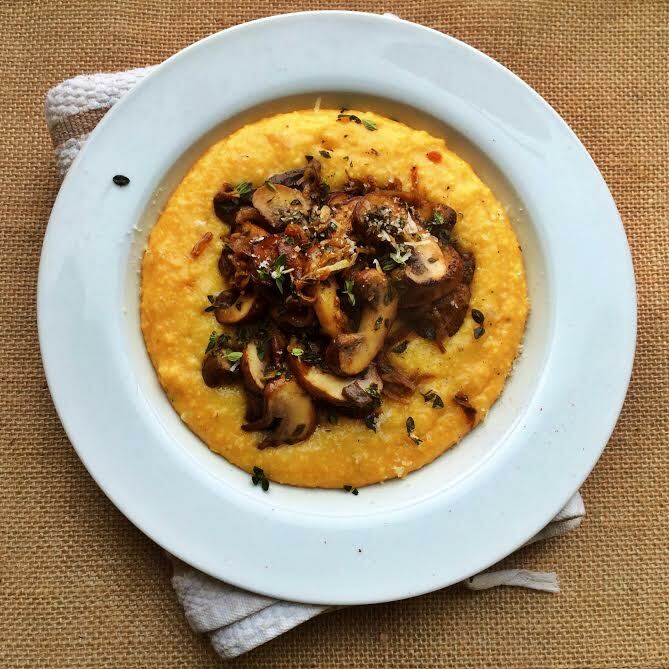 Enter: parmesan polenta with lemon thyme mushrooms. 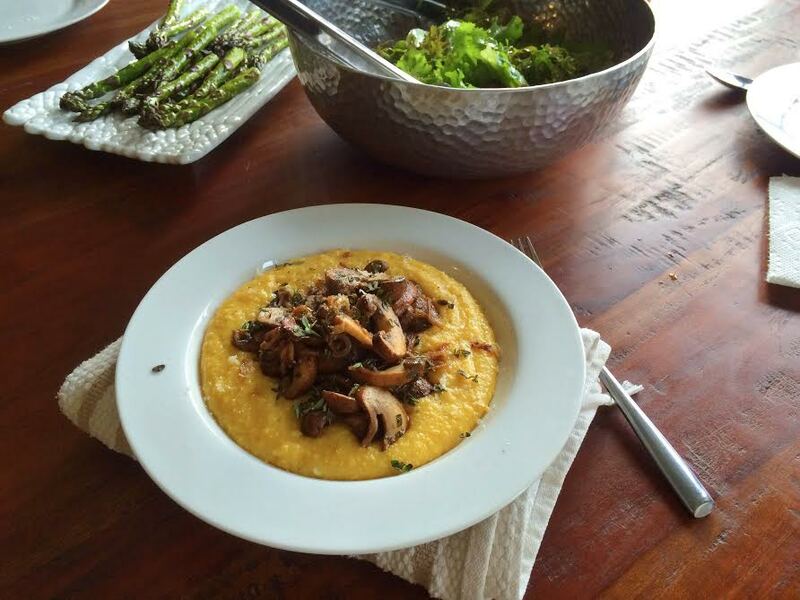 Gorgeous mushrooms from the farmers market sautéed with shallot, garlic, thyme and lemon on top a bed of creamy, cheesy polenta. Yes please. A little side of farmers market greens and this was one comforting, vegetarian, gluten-free meal. Sidebar- this polenta is pretty full proof and would be great with a number of hats including shrimp, chicken, spinach, etc. Preheat oven to 350 degrees F. In a large saucepan (I used a dutch oven) heat the olive oil over medium heat. Add red onion and pinch of salt and cook for 4-5 minutes. Reduce heat to low, add garlic, and sauté 1-2 minutes. Don’t burn garlic. Increase heat to high. Add chicken stock and bring to boil. Slowly add in cornmeal while continually whisking. Cover pot and place in oven. Cook for 35-40 minutes, whisking every 10 minutes to prevent lumps. Remove from oven add butter, salt/pep (season aggressively maybe a few teaspoons of salt) and parmesan. Heat a large non-stock sauté pan over medium high heat. Add olive oil and sliced shallot. Saute for 3-5 minutes. Add garlic and sauté for 30 seconds. Immediately add in mushrooms. Saute for 10 minutes. Off the heat, add lemon juice and thyme. 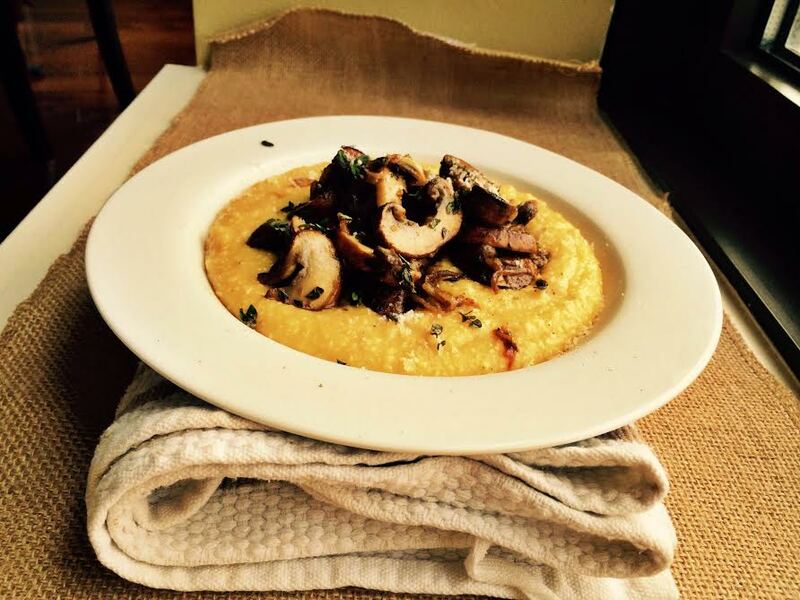 Fill a bowl with a polenta pile. Top with a solid amount of mushrooms, a sprinkling of thyme (if extra’s around… I know thyme is just awful to pull off those little twigs) and some more parmesan.